The Deputy Commissioner of Ri Bhoi district speaks at the inauguration function on Friday. 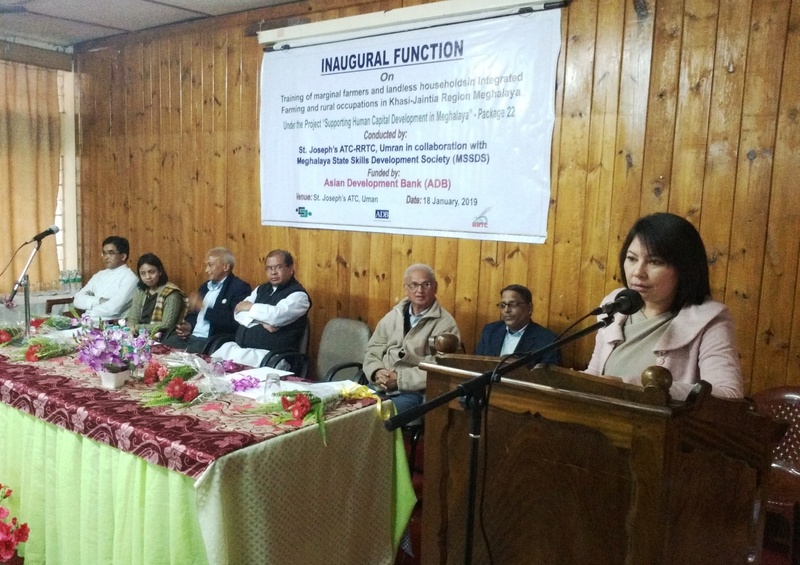 NONGPOH : A two-month training for marginal farmers and landless household in integrated farming and rural occupation in Khasi-Jaintia Region was on Friday inaugurated by R.M. Kurbah, Deputy Commissioner of Ri Bhoi District and Executive Director, MSSDS at RRTC, Umran. The training is being held under the project “Supporting Human Capital Development in Meghalaya”-Package 22 organised by St. Joseph’s Agricultural Training Centre in collaboration with Meghalaya State Skill Development Society (MSSDS), Shillong. The project is funded by Asian Development Bank. The objectives of the project are to improve the living standard of the families by introducing simple methods which require minimal investment and get maximum possible returns, ensuring the beneficiaries to understand and follow the techniques that translate into results and to provide startup tools, financial linkages for long term sustainability. Seventy trainees drawn from the six districts of Khasi-Jaintia are attending the programme which include piggery bokashi, IMO medication castration, management etc., in livestock, vermicomposting and other organic composts, bio pesticides and their application in agriculture, vaccination, brooding, feeding and sustainable poultry (local breeds) in poultry, demonstration of extraction of honey, division of bee colony identification of bees, manual processing of honey etc., in beekeeping, social programmes like Swatch Bharat, family gathering and games, bank and market linkages, food processing, exposure trip etc.